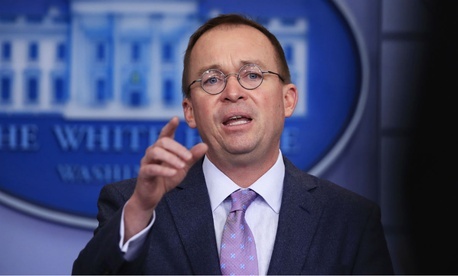 Since his first trip from the Old Executive Office Building across the street, White House budget Director Mick Mulvaney has roiled consumer groups with his cross-grain policy changes as acting director of the Consumer Financial Protection Bureau. Now, under the 1998 Federal Vacancies Reform Act, the long-time critic of the agency he temporarily runs is set to leave by June 22, which will be 210 days since his appointment by President Trump last November. In a session with national reporters last Tuesday, Mulvaney confirmed that Trump next week will likely nominate a permanent director among candidates being vetted by Treasury Secretary Steven Mnuchin, economic advisers Larry Kudlow and Kevin Hasset. He said he expects to be around CFPB until the end of 2018 while the Senate processes Trump’s nominee, and then to help that successor get oriented. But running the Office of Management and Budget, he told The New York Times, is his dream job. The 210-day clock would “start over,” agreed Debra D’Agostino, a founding partner of the Federal Practice Group. “There’s no telling how long Mulvaney would keep going if the Senate rejects the nominee or the candidate backs out—it could stretch into next year.” This being a mid-term election year and the Republican Senate majority at a slim 51 seats, confirmation of any Trump nominee is not a sure thing. Her argument, backed by senators such as Elizabeth Warren, D-Mass., who conceived of the bureau, “has two prongs,” D’Agostino said. The 2010 Dodd-Frank Financial Reform Act “specifically states that the deputy director becomes acting director if the director becomes unavailable, and it specifically says that OMB should not have oversight of the bureau,” she said. But Trump argued that the Vacancies Act allowed Mulvaney to serve for 210 days until Trump appoints someone new. “The court at the end of the day felt it was a separation of powers issue, and didn’t want to tramp on the president’s rights,” she added. Candidates being considered, according to news reports, include J. Mark McWatters, board chair of the National Credit Union Administration, and a financial industry regulator. Also mentioned is Todd Zywicki, a law professor at George Mason University’s Mercatus Center, and retiring Rep. Darrell Issa, R-Calif. Issa told Government Executive this spring that he was looking for a job in the administration, and he was rumored to have his eye on the deputy secretary of Commerce position, though that nomination on June 4 went to investment adviser Karen Dunn Kelley, who is currently undersecretary of Commerce for economic affairs. Mulvaney, meanwhile, is continuing his agenda with cutbacks on enforcement and firing of consumer advisory board members. In his Tuesday press session, he defended his decision to change the bureau’s name to the Bureau of Consumer Financial Protection, to literally adhere to the Dodd-Frank language. He said rearranging the letters required little cost, and that existing CFPB stationery will be used until supply runs out. More substantively, he will ask the Federal Reserve Board to cut the bureau’s fiscal 2018 funding by about $200 million. He has asked staff to identify 20 percent cuts in spending, mostly in travel, rather than in reductions in employees.